Early in my journalism education, I was taught the school of thought that all compound modifiers should be hyphenated -- "except high school." The logic isn't hard to follow. Especially in sports coverage, the linkage is obvious and the punctuation would be rampant. And even making that your lone exception is an extreme position, at least in the bell-curve sense. In the real world, few would hyphenate ice cream cone or peanut butter sandwich or real estate agent or law enforcement officer. The list goes on. Leave it to me to be more extreme still. I do hyphenate high-school football and the like, as well as ice-cream cone, peanut-butter sandwich, real-estate agent and law-enforcement officer. But even I would never add a second hyphen to high-school football games. The logic of the double hyphenation is at least debatable. 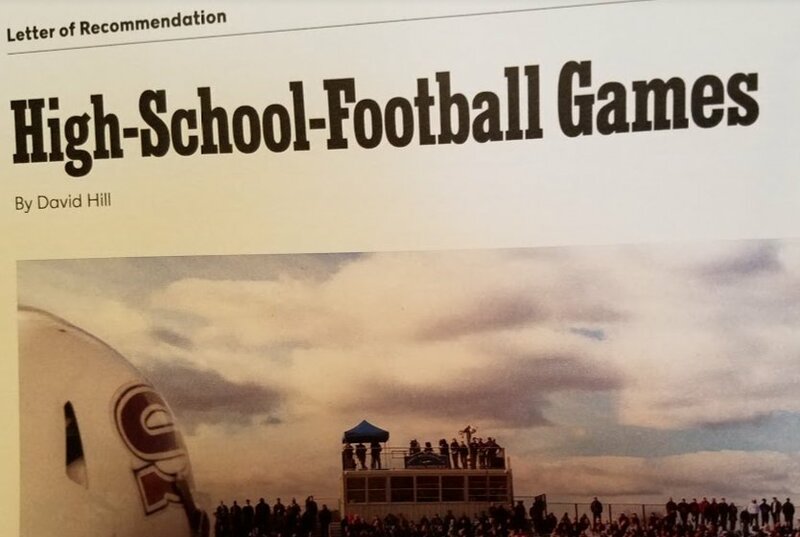 In publishing the above headline, the New York Times Magazine is casting games as a noun that's being modified by high-school football. "I'm going to a game tonight." "I'm going to a football game tonight." The sport is football. There is high-school football, college football and professional football, but the sport is football. High-school football is not a sport in itself. And even if the logic argument ended in a draw, I would invoke the "plausible deniability" clause. One could argue for special-needs student accommodation or special-needs-student accommodation, but why risk annoying hyphen-averse readers when the single-hyphen version is perfectly understandable and logically defensible? 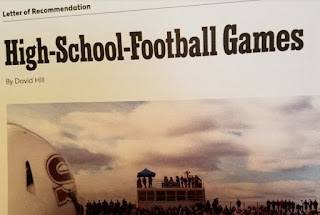 Now then: By no means am I saying there's no place for the doubly hyphenated high-school-football. Whereas a debate within a high school about football would be a high-school football debate, a similar debate among taxpayers, lawmakers or the culture at large would most certainly be a high-school-football debate. The former is a high-school debate; the latter is not. INCREMENTAL HEALTH UPDATE: Well, I still have cancer, as detailed here, here and here. I'm not thriving under this regimen the way I did under chemotherapy. The nausea is back, often accompanied by far-too-quick satiety and other unpleasant tummy symptoms. The left thighbone and the spine show no signs that their metastatic bone lesions have disappeared. Still, these are minor complaints within the much bigger complaint. I'm pretty lucky to be feeling as good as I do under the circumstances. We're at the halfway point, so we should get a look at images of my liver in four or five weeks to show whether the experimental drug shrank, or at least held steady, the tumors. I very much enjoy your blog and have for some time now. I'm sorry to hear about your illness and I'm pulling for you.